Gluttony is not a problem, as long as you don't over do it. INXS, What You Need 1985. Their first American Top Ten hit. At that moment, it was what I needed. 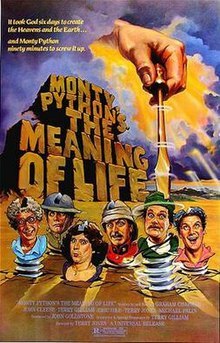 Monty Python's The Meaning of Life 1983. Various sketches of comedy covering different stages of life. I resembled Mr. Creosote at that restaurant. I'm surprised I didn't explode all over everybody. Man v. Food, Travel Channel 2008-2012. Adam Richman lost 70 pounds when he retired from that show. Huh. If their is a sequel, I'm sending in my resume.